Some people argue that theory is just books and not a practical approach. They do not realize the fact that the book has the practical experiences of the author. Some of the famous books which could be very useful in the practical world are as follows. This book is written by Bob Burg. There are many books about “networking” but none is as good as this book because this book addresses two issues simultaneously. The first one is description of the broad spectrum of options that generate referrals. The second one is the description of specific, actionable, steps as Endless Referrals of Bob Burg. This book shows what to choose the implementation of a referral action program. Jay Conrad Levinson is the author of this book. 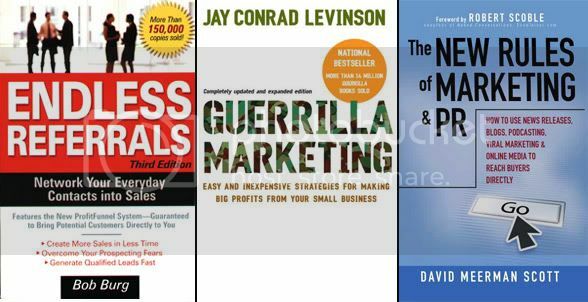 The Guerrilla Marketing book series has redefined the marketing. Among the marketing book series this is the best selling in the world. The rules for authors interested in creating a brand that is based on title have be redefined in this book. The different versions of the books are aimed at specific vertical markets. This book is authored by David Meerman Scott. This book has created a new model for publishing success. This book has come out with a new connection between the books and the internet marketing. This book also reveals how giving of free ebooks and chapter sharing with readers can help the sales success of the book. This book is written by Patrick Hanlon. This book shows how to approach branding in an organized way. This book avoids the usual abstractions. This book is based on a few case studies and key concepts. This book provides a program that is easy and can be easily programmed. The author of this book is Andy Sernovitz. This book is one of the most trusted ones. At the same time you will find that the marketing tools mentioned in this book are also the most misunderstood marketing tools. This books shows how to handle effectively the word of mouth marketing. This book is authored by Claude Hopkins. This book has nearly everything and every aspect about copywriting. The author of this book has been the inventor of coupon sampling and test marketing. The basic fundamentals and fixed principles mentioned in this book prevail even today. This book is penned by Debbie Weil. This book is to the point. This book highlights the main blogging concepts to the corporate executives. It also show the importance of meaningful blogs to attract the customers and clients. 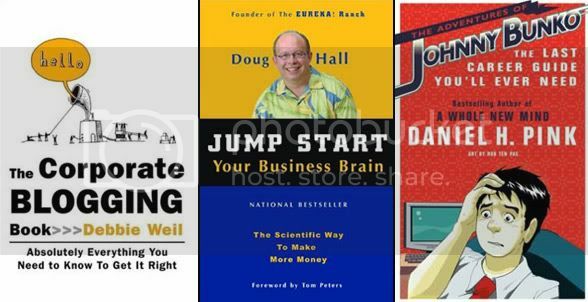 Doug Hall is the author of this book.This books identifies the elements that should be contained in your marketing messages. Big profit can be achieved by small changes in the content of the message. The author of this book is Daniel H. Pink. This book is published in Manga Style which is basically from Japan. This book is an excellent combination of a great medium and equally fine message. This book shows how topics that are complex can be simplified especially for audiences who run short of time to read voluminous books. This feature makes it a great gift for recent college graduates. This book is authored by Michael A. Stelzner. This book reveals the marketing powers of the white paper. A step by step plan for the creation of a series of white papers is provided in this book. The mailing list can be best built with the help of white papers. The book reveals what the white papers should include and exclude. This book is penned by Garr Reynolds. This book is about making the presentations more lively and interesting so that the audience do not get bored. The author makes his points clear with the help of simple ideas that are quite productive and effective. This book is a must for those marketing professionals who have to do presentations day in and day out. The author of this book is Roger C. Parker. This book emphasizes on the importance of a long term, content driven relationship view of website. After the advent of the internet many people have started giving importance to websites as a customer retention tool. This book stresses on viewing websites. Robert W. Bly is the author of this book. This book primarily focuses on white paper. It has relevant content about successful direct marketing. This book can also be of much help at generation of qualified leads through the internet or in print media. This book is penned by Seth Godin. This book has best of advice on advertising. This book emphasizes on the need of offering a bait to the prospective customer or client so that he/she pays more attention to the message given by the volunteer. Volunteering is one of the best ways to seek the attention of the prospective customer or client because the other ways of drawing the attention of the client or customer have become too common in the market. This book is written by Al Ries and Jack Trout. This book is about positioning the product. This book also gives an insight into the mind of the customer. The strategies mentioned are exemplified with numerous examples. This first version of this book was out in 1981 but is applicable even today. 1. Competing For The Future By C.K. Prahalad & Gary Hamel. 2. Kotler on Marketing: How to Create, Win, and Dominate Markets By Philip Kotler. 3. How to Win Friends and Influence People By Dale Carnigie. 4. Market Research: A Guide to Planning, Methodology and Evaluation By Paul Hague. 5. Art of War By Sun Tzu. 6. Strategic Management By Gregory Dess, Lumpkin & Taylor. 7. How Winners Sell: 21 Proven Strategies to Outsell Your Competition and Win the Big Sale By Dave Stein. 8. Beyond Bullet Points: Using Microsoft® Office PowerPoint® 2007 to Create Presentations That Inform, Motivate, and Inspire By Cliff Atkinson. 9. Selling the Invisible: A Field Guide to Modern Marketing By Harry Beckwith. 10. Marketing Services: Competing Through Quality By Parasuraman & Leonard L. Berry. 11. Marketing Management (12th Edition) (Marketing Management) By Philip Kotler. 12. Consumer Behavior: Building Marketing Strategy, 9/e, (with DDB Needham Data Disk) By Hawkins, Best, & Coney. 13. Crossing the Chasm: Marketing and Selling High-Tech Products to Mainstream Customers By Geoffrey A. Moore. 14. Mind and Heart of the Negotiator, The (3rd Edition) By Leigh Thompson. 15. Radically Transparent By Andy Beal & Judy Strauss. Certainly, it will be very usful for webmaster. I can suggest to view if u r interested to develop your skill in SEM. Great post on the marketing books, I am going to blog about it on my Marketing Professional blog. Hey thanks for including me in your great list. Very useful. I’ve read about half of these, and agree they belong on a list like this. Not only are these good for marketers, but they’re good also for small business owners or freelancers who are going the DIY route. And you’re the only other person I’ve encountered who’s even heard of Primalbranding. I reviewed in on my own site a while back–highly recommended. Wow, I haven’t read any of them (although I do read Seth’s blog). Good thing I don’t officially consider myself a marketer! Good list. I’ve read a few, but not all. Adding them to my “holds” list at the local library right now. I’d suggest adding “Groundswell” by Charlene Li and Josh Bernoff. Makes a great business argument for joining the social media conversation. I’d add any of the books by Patricia Seybold. Customers.com to start off. Very good for all things CRM. Don’t forget: “here comes everybody” – search for it on Amazon. And also Groundswell recommended by Scott. Thanks for including my “Writing White Papers” book among your most excellent list! I am currently reading several by Ogilvy which are amazingly still relevant.